In 1967, the year of the Summer of Love, a group of UCSC students started an FCC-unauthorized campus radio station that broadcast from a clammy basement and tried to use an upside-down garbage can as an antenna. The broadcasters initially put egg cartons instead of acoustic tiles on the walls, and the disc jockeys played the psychedelic single, “Incense and Peppermints” by the Strawberry Alarm Clock, so many times the record cracked. They kept on playing it anyhow. “When I left campus, [the station] was very shaky,” said Marc Okrand (Stevenson College ‘70, interdisciplinary studies), who went on to have a far-ranging career that included teaching linguistics at UC Santa Barbara, doing research for the Smithsonian and, most famously, developing the Klingon language for Star Trek—both for the movies and also for Star Trek spin-off TV shows. Now that the station is turning 45, its broadcasting alumni are not only nostalgic but also grateful. In a world of corporate playlists and stations serving the same old warmed-over casserole dishes full of trendy singles and moldy oldies, KZSC (88.1 FM) continues to serve up platters you won’t find anywhere else, including an all-vinyl glam-rock show. It also has produced a cadre of talented broadcasters who earned their stripes at the KZSC microphone and are now working in the industry: at the popular This American Life radio program, at the San Francisco Giants organization, and in the podcast world, among others. With the same free spirit, KZSC now has a patina of practicality, which provides immersive training and resume-filling skills—something the first batch of broadcasters, huddled in their dank headquarters, might never have imagined. The original home for the radio station was in the basement of Dorm 2 at Stevenson College. The broadcasters ran afoul of the FCC when the signal began to interfere with a Monterey radio station that was trying to reach its listening base in Santa Cruz, according to early KZSC alumnus Okrand. This impasse forced the broadcasters to go off the air for a time and return, briefly, as a “pirate” station before filing for a license and going legit. In 1974, KRUZ began broadcasting under its current name—KZSC—calling itself the “tiny 10-watt titan.” The signal was so weak KZSC staffers printed up articles in their seasonal program guide, urging listeners to install simple wire antennas called “dipoles” in their dorm rooms to beef up the reception. A few fanatical listeners made their own antennas using $2 kits. In 1980, the “10-watt titan” transformed into the “1,250-watt marvel,” four years after filing an application to the FCC. The radio station became a powerful presence not just on campus but in the community at large; for example, broadcasters provided live on-the-ground coverage of an enormous downtown protest against the bombing of Iraq in 1991. In the aftermath of the 1989 Loma Prieta quake, KZSC filled a critical role in UCSC emergency communications. Now, with the help of a backup generator shared with the UCSC Fire Department, KZSC continues to provide emergency information to the community, sending out alerts in situations ranging from regional AMBER Alert child abductions to chemical spills and wildfires. KZSC got another power boost in 2002 with an upgraded 10,000-watt signal. Also in 2002, UCSC students passed Measure 4, which provided KZSC with one-time funding of $100,000 for much-needed renovations. This was the first time students directly contributed financially to their campus radio station. In 2007, the station went up to 20,000 watts. For all its changes, KZSC has stayed, strikingly, the same in many respects. 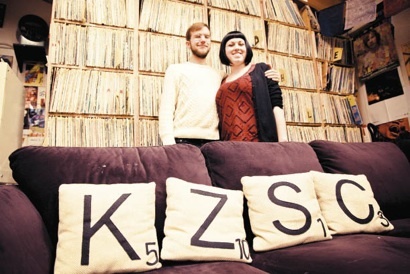 Even as they embrace digital technology—with a robust Web presence (www.kzsc.org), live streaming, and Facebook promotions—KZSC’s broadcasters have a vinyl fetish that never goes away. If you walk into the station after climbing 19 tree-fort stairs, you will still see Leon Redbone’s inscrutable face on a poster from the 1980s. You’ll find astounding numbers of LPs stacked so high against the walls that DJs must zip around the storage area on a rolling ladder. KZSC’s vinyl library gives its young broadcasters an intimate connection with the past. KZSC’s student program director Tyler Wardwell, 24 (Kresge College, ‘12, American studies), immersed himself in the blues to prepare for his show. “I took out 20 records at a time and listened to every song,” he said. Future broadcasters may have their own nostalgia when it comes to current programming, which includes Tyler Wardwell’s “Dusty Finger$,” a blend of soul music from America and the African diaspora; a weekly David Bowie tribute show (“Dance Magic Dance,” Mondays at 1 p.m.); traditional blues (“Spoonful of Blues,” Sundays at 8:30 p.m.); a show with a focus on live music in Santa Cruz (“Coming to Town,” Fridays at 4 p.m.); followed by a weekly Slug Sports review (“Slug Talk” at 5 p.m.); a ska show (“Skallelujah,” Fridays at 8:30 p.m.); plus a few that are beyond description. “What do you call a show that blends field recordings of a neighbor’s chickens with the Sun Ra Arkestra, or 1970s self-meditation tapes mixed with synthesizers from the ’90s?” asked Michael Bryant, who has been KZSC’s broadcast advisor for a decade. Thorn’s highly original broadcasting persona hasn’t changed much since his days at UCSC, even though his roster of high-profile guests now includes Stephen Colbert and David Wain (director of Wanderlust and the polarizing comedy hit Hot Wet American Summer). His work ethic, combined with the live format, helped him create a template he still uses. Julie Snyder (Kresge ’95, politics), a former KZSC news director and now a senior producer for This American Life, distributed by Public Radio International, loved the hands-on quality of the station. “I kind of lived there for four years,” she said. Former Slug sports correspondent Justin Bercovich (College Nine, ’08, American studies) went on to work for the San Francisco Giants. Student broadcasters must take a five-unit Intro to Radio class, which fulfills their general education public service requirement, and provides not only hands-on training but also the history of the radio’s broadcast medium, FCC regulations and how KZSC fits into today’s mass communication spectrum. The current crop of UCSC broadcasters speak of the various skills they learned as well, from learning how to build up a Web presence to growing interpersonal skills, managing databases, learning how to build consensus, and overseeing other volunteers. “It’s a tactile learning experience,” said KZSC advisor Bryant. KZSC’s anniversary is more than just a milestone for the campus and the radio station. It’s a sign that the analog world still has a place in our digital culture. There is something “hand-made” about the radio medium, where the broadcasts are live and the possibility of human error only adds to the excitement. With an annual operating budget of about $80,000, KZSC receives no direct funding from UCSC. The station’s primary sources of income are from underwriting—educational radio/television’s equivalent of advertising—and listener donations. KZSC plans to mark the anniversary throughout the year, with special programming and campus and community events. Bryant said he’d also love to send out a call to broadcasters from various phases of KZSC’s history. Listeners may make contributions to KZSC on the station’s website, www.kzsc.org. Contact Dan White at dwhite1@ucsc.edu.